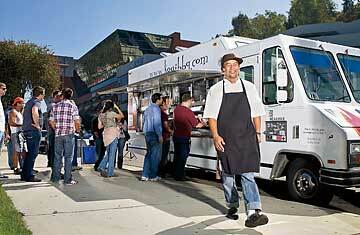 Choi hauled in $2 million in sales the first year he parked a food truck in Los Angeles. Every movement needs a creation myth, and the gourmet-food-truck movement has a really good one. In 1996, Roy Choi, a law-school dropout and a general disappointment to his Korean-immigrant parents, was watching the Food Network one afternoon, eating Cheetos while coming down from some serious drugs, when suddenly Emeril Lagasse started talking directly to him. "He came out of the TV," Choi recalls, "and said, 'Smell this. Touch this. Taste this. Do something.'"